Daedalea quercina, as its species name suggests, is partial to oaks. 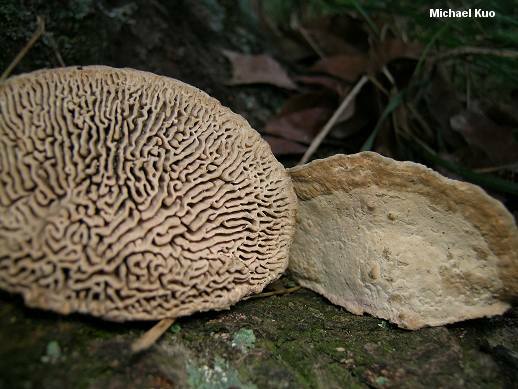 It is a distinctive polypore with a thickly maze-like pore surface (as its genus name suggests; Daedalus designed the maze that hid the Minotaur) and a whitish to grayish or brownish cap surface. The tough flesh is whitish to pale brownish--but never rusty brown or dark brown. Species of Gloeophyllum can look somewhat similar, but feature brown to rusty brown flesh and gill-like undersurfaces. Daedaleopsis confragosa is similar, but its maze-like pore surface is less regular, has thin walls, and usually bruises reddish. Lenzites betulina has a gill-like undersurface. 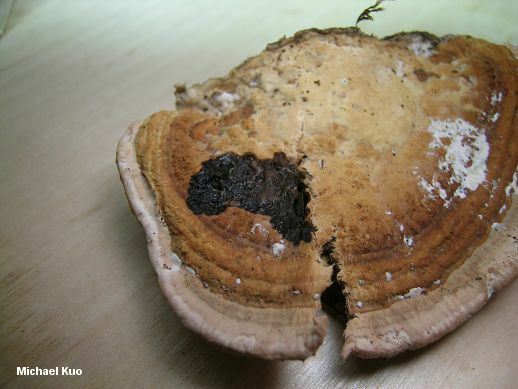 Ecology: Saprobic; growing alone or in small groups with fused caps on decaying oak wood (occasionally on the wood of other hardwoods); annual or perennial; causing a brown rot of the heartwood; widely distributed in North America, but rare west of the Mississippi. 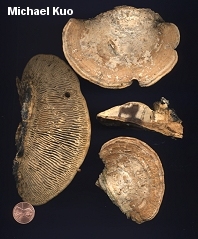 Cap: 4-20 cm; broadly convex to more or less flat; fan-shaped in outline; dry; smooth or finely fuzzy (generally smoother toward the margin); whitish when fresh, but grayish, brown, or black in age (often darker toward the point of attachment in specimens that are several years old). 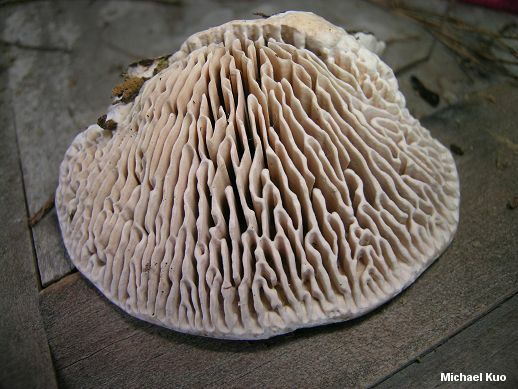 Undersurface: Maze-like, with thick walls (about 1-3 mm wide); occasionally developing pore-like or gill-like areas; whitish when fresh, becoming dingy yellowish or pale tan; not bruising; tubes to 4 cm deep. Flesh: Whitish, or with age brownish; very tough. Chemical Reactions: All parts dark gray to black with KOH. Microscopic Features: Spores: 5-6 x 2-3.5 µ; smooth; cylindrical to elliptical. REFERENCES: (Linnaeus, 1753) Persoon, 1801. (Saccardo, 1888; Overholts, 1953; Smith, Smith & Weber, 1981; Arora, 1986; Gilbertson & Ryvarden, 1986; Phillips, 1991/2005; Lincoff, 1992; Barron, 1999; McNeil, 2006; Miller & Miller, 2006; Binion et al., 2008.) Herb. Kuo 04230404, 07120901, 07210903.